Exactly a week after two Russian planes crashed in what officials say were terrorists attacks, at least 10 persons were killed and 51 wounded in a suicide attack last night near the entrance of a crowded metro station in Moscow. Al-Qaida operatives, including an Egyptian, a senior official said today. The pair, one of whom was identified as Sharif ul Misri, were arrested in the southwestern city of Quetta on Monday, said Sheikh Rashid Ahmed, Information Minister in Pakistan’s outgoing cabinet. 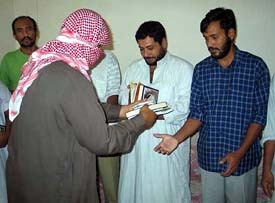 Captive truck drivers (Including three from India) receive gifts before their release from a Baghdad building on Wednesday. A Kuwaiti company with seven truck drivers held captive in Iraq said that they have been freed by their captors. The Pakistani President, General Pervez Musharraf, swore in an expanded 32-member Cabinet headed by new Prime Minister Shaukat Aziz today. The new Cabinet included all 20 members of the previous Cabinet and 12 new full ministers, Pakistan Television reported. Pakistani national Aman Khan Hoti and his Indian wife Dr. Hafza Aman continue to face an uncertain future in the wake of home ministry’s refusal to grant her Pakistani citizenship. 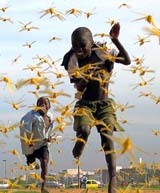 Senegalese children run as locusts spread in the capital Dakar on Wednesday. Only a military-style operation with bases across West Africa can stop the worst locust invasion for 15 years, Senegal's President Abdoulaye Wade said on Tuesday as the insects swept into his capital. The United Nations Food and Agriculture Organisation (FAO) warned last week that the locust swarms infesting countries from Mauritania to Chad could develop into a full-scale plague without additional foreign aid. Amid hundreds of cheering party men, the Republican Party today nominated US President George W. Bush as its presidential candidate at the party's national convention here, with Hollywood star Arnold Schwarzenegger and First Lady Laura Bush urging voters to re-elect Bush. The mother of a British soldier killed in an Iraqi ambush has launched a petition for the withdrawal of UK troops as she prepares to sue the Ministry of Defence over the death of her only son. Amid US pressure on Iran to come clean on its nuclear programme, China today said it had cooperated with Teheran in the nuclear energy field, while asserting that a nation cannot be denied the right to develop nuclear energy for peaceful purposes. US astronomers have announced the discovery of two new planets outside the Earth’s solar system, the smallest planets ever detected so far from Earth. According to Moscow Mayor Yuri Luzhkov, who rushed to the blast site with top police and security officials, the suicide bomber - a woman, blew herself in the thick crowd near the entrance of Rizhskaya subway station of metro railway at 20.17 p.m. local time (21.37 IST). "The woman who had explosives almost one kilo equivalent of TNT filled with nuts and bolts, was heading for the metro station; however, on seeing two policemen who were checking documents she turned back and blew herself in the thick crowd," Luzhkov said.. The circus-like round glass building of Rizhskaya metro station situated on the posh Prospekt Mira linking downtown Moscow with its northern suburbs was damaged in the blast and the authorities closed it for the passengers and trains were stopping there. The whole area had been cordoned off and around 20 ambulance vans were ferrying injured to the nearby hospitals. "There was a powerful blast and then a amaller one, I thought my roof would come off," an eyewitness who was driving past the blast site said. Federal Security Service spokesman Sergei Ignatchenko denied earlier reports of a car bomb blast, saying cars parked near the station caught fire due to the blast. Meanwhile, an Islamist group claimed responsibility for a deadly bombing in Moscow and vowed more attacks in "infidel" Russia, according to a statement published on a Web site. Taking a serious note of the terror attacks, The White House condemned the downing of two Russian airliners and the suicide bombing that killed at least 10 persons outside a busy Moscow subway as "horrible attacks." Pakistani security forces have arrested two important Al-Qaida operatives, including an Egyptian, a senior official said today. The pair, one of whom was identified as Sharif ul Misri, were arrested in the southwestern city of Quetta on Monday, said Sheikh Rashid Ahmed, Information Minister in Pakistan’s outgoing cabinet. “These are important people,” Ahmed said adding that Ul Misri had a price on his head. He did not say who had offered the reward for Ul Misri’s capture and he is not among the US Federal Bureau of Investigation’s most wanted terrorists. Ahmed said investigations were under way to ascertain the identity of the other man. 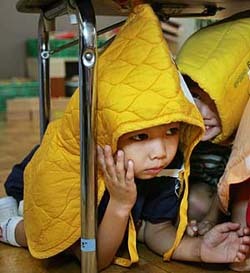 “They keep on changing their names and aliases and it takes some time to establish. But we have identified Sharif ul Misri,” he said. Ul Misri was the third Egyptian Al-Qaida suspect Pakistan says it has arrested in recent weeks, but the organisation’s top Egyptian member, Osama bin Laden’s deputy Ayman al Zawahri, has remained as elusive as his boss. Security forces in Pakistan, a frontline state in the US-led war on terror, have arrested more than 70 men linked to Al-Qaida as part of a major crackdown since July. Pakistan’s crackdown has included raids on mosques and Islamic schools and followed the arrest of Mohammad Naeem Noor Khan, a computer expert officials say has provided crucial information about Al-Qaida operatives and the organisation’s plans to launch attacks in the UK and the USA. Yesterday, security forces arrested another Al-Qaida suspect from a religious school run by a senior Islamist politician currently visiting India, officials at the school said. Officials said Aziz, credited with turning around Pakistan's economic fortunes over the past five years, would retain the Finance Ministry while Foreign Affairs would stay in the hands of Khursheed Mehmood Kasuri, who has led peace talks with India. The new faces include Javed Ashraf Qazi, a former head of the Inter Services Intelligence (ISI). Qazi is a trusted ally of Musharraf and served as Railways Minister under him after he seized power in 1999. Officials said the portfolios of some ministers could be changed, with Qazi a possibility to take over from Faisal Saleh Hayat at the Interior Ministry. “I have lost all hope, leaving with me no option but to leave Pakistan and settle in another country,” Hoti said. He said the Interior Ministry officials keep on citing “security reasons” behind their persistent denials to grant Pakistani nationality to his wife. Dr Divya Dayannadan, 25, married Aman Khan Hoti in July last year after embracing Islam and changing her name to Hafza. They settled in Mardan, 60 km north of Peshawar. The couple, who had first met in Ukraine in 1998, submitted numerous applications to senior officials in the Home Ministry to have Dr Hafza registered as a Pakistani citizen, but they were repeatedly refused. Setting the tone for the "terminator" and Laura Bush to deliver their power-packed speeches at the highly fortified Madison Square Garden, delegates officially nominated Bush, while some 1,000 slogan-shouting protestors were arrested on the streets for their anti-Bush demonstrations. Schwarzenegger and Laura Bush, who was introduced by her husband through a live video link from Pennsylvania, stole the show on the second day of the convention and both of them hailed Bush as a crisis man and sought another "four year term" for him. In a ringing endorsement of her husband, the First Lady said Americans could count on Bush, and justified his decision to attack Iraq. Mrs Gentle says in the past few weeks she has spoken to many mothers who share her concerns over the way the Iraq situation is being handled. “I have had a lot of people phoning me, people stopping me in the street saying ‘don’t give up’. There’s a lot of mothers who just don’t want their sons to be sent out there,” she said. It is partly in response to those conversations that she and her daughter, Maxine (14), have started the petition campaign, which is to be run from her son’s former bedroom in the family’s council house in Pollok, Glasgow. “We will have a website soon where people can sign the petition on line. I will take it to Tony Blair myself,” she said. Private Gentle (19) was standing on the spare wheel in the back of a military vehicle in June when his chest took the full force of the explosion of a roadside bomb. It killed him almost instantly. It is only in the past few weeks that his family have been led to believe that his death could have been prevented if his regiment had been provided with up-to-date equipment that would have stopped the radio-controlled roadside device being detonated. Troops from the Royal Highland Fusiliers were issued with the equipment two days after Private Gentle was killed. For the grieving mother, who has shed more than five stones in the past two months, the failure to protect her only son is tantamount to murder. “Just one piece of equipment could have prevented my Gordon’s death,” she said yesterday. “Comments about me just being a grieving mother with no right to express my views on the Iraq war make me sick,” said the mother of three, who says she tried to talk her son out of enlisting. However, coming from an area of Glasgow that is rife with poverty, her son saw the army as a way of swapping his £42 a week unemployment benefit for a chance to travel, learn a trade and get a driving licence. He signed up at the end of last year and completed his basic training in April, just a few weeks before he was sent to Iraq. Two of his uncles had served in the same regiment. Mrs Gentle has applied for legal aid to sue the Ministry of Defence for negligence and has engaged John Cooper, the barrister who represented relatives of the soldiers who died at the Deepcut Army Barracks, to handle her case. In the late 1980s and early 1990s, China had carried out cooperation with Iran in peaceful uses of nuclear energy, Vice-Minister in charge of the Commission of Science, Technology and Industry for National Defence, Zhang Huazhu said while responding to a question on China’s nuclear cooperation with Teheran. “China is a signatory to the Nuclear Non-proliferation Treaty (NPT) and has firmly participated and supported the international endeavour on non-proliferation. The planets are 15 to 20 times the mass of earth and about the size of Neptune, the eighth planet from the Sun, a NASA release said. “These Neptune-sized planets prove that Jupiter-sized, gas giants aren’t the only planets out there,” said astronomer Geoffrey Marcy of the University of California, Berkeley. The discovery was made by a team led by Macy and another led by Barbara McArthur of the University of Texus at Austin.